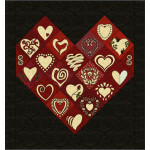 Looking for something sweet for that special someone? Well, here's something fun, fun, fun! 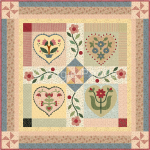 Pieced heart blocks are surrounded by a frame of daisies, with one single appliqué daisy providing a special accent in this charming wall hanging. 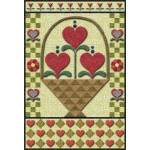 Sweet, delicate hearts along with a floral touch make of this a truly charming little quilt.Finished..